1. Cook the noodles according to pack instructions. Mix together the tamarind paste, fish sauce, soy sauce and sugar. 2. Heat the oil in a wok or large frying pan and fry the garlic and salad onions for 1-2 minutes, crack in the eggs and mix quickly to resemble scrambled egg. 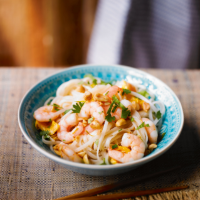 Add the prawns and beansprouts and cook for 1 minute. Stir in the cooked noodles, the sauce and all but 3 tbsp of peanuts. 3. Serve in big bowls scattered with the remaining peanuts and chopped coriander sprinkled over.